After an early morning pick up at your accommodations, we will begin our exciting day discovering the historic towns that lie in the semi-arid plain on the other side of the High Atlas Mountains. Leaving Marrakesh, the snow covered peaks of the High Atlas Mountains will slowly become more and more visible. Driving higher and higher, we will encounter the numerous winding switchbacks of the Tizi n’Tichka mountain pass, a marvel of modern engineering and design. At 2,260m above sea level, we will stop at the crest of the Tizi n’Tichka to gaze at the surrounding mountaintops. Going down the other side of the High Atlas Mountains, we will veer off the main road to discover the traditional village of Ait Benhaddou, before continuing to the city of Ouarzazate. In this region we’ll discover villages famous for their distinct mudbrick architecture and preserved fortified town centers (Kasbah). It’s of historic interest to note that all these towns grew powerful with the boom of trans-Saharan trade in the Middle Ages that linked Marrakesh to the sub-Saharan kingdoms; notable among them, Timbuktu. 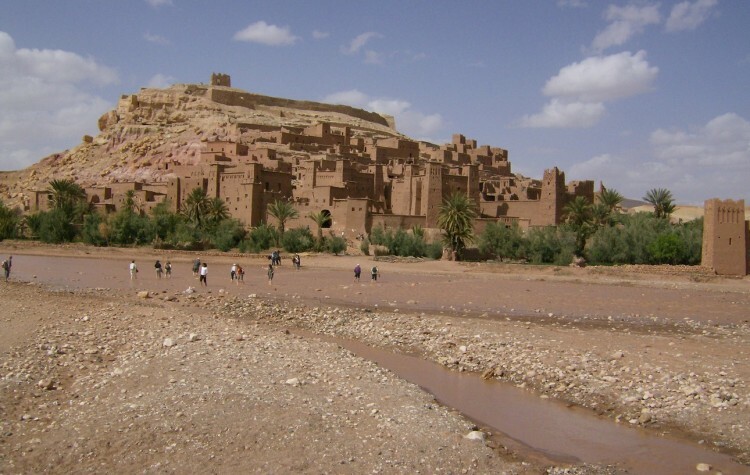 After about a 45 minute drive, we’ll arrive at the village of Ait Benhaddou, an important UNESCO sight in the region. With its many towers and traditional houses, Ait Benhaddou stands as the most striking example of the pre-Saharan architecture of southern Morocco. We can have lunch at one of the excellent restaurants overlooking Ait Benhaddou. Our last stop today will be in the capital of southern Morocco, Ouarzazate. Like Ait Benhaddou, Ouarzazate boasts an important fortified center, the Taourirt Kasbah. 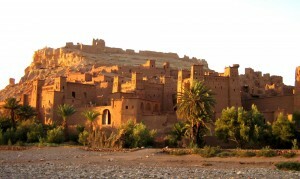 However, what makes Ouarzazate most famous today are its internationally renowned movie studios. 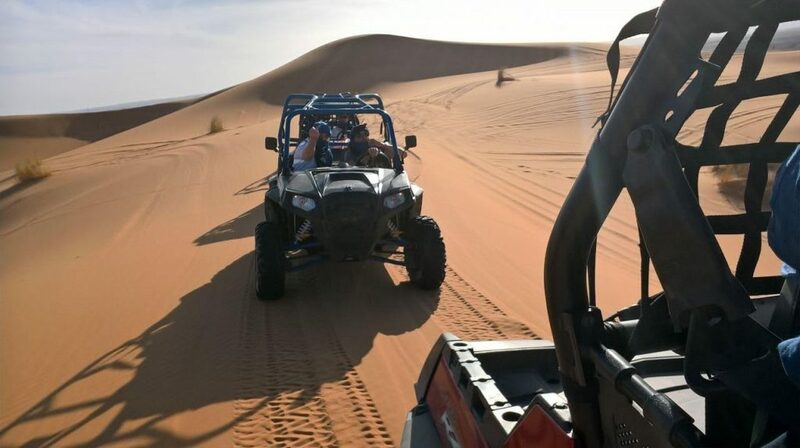 Taking full advantage of southern Morocco’s beautiful desert landscapes, these studios have contributed to Hollywood blockbusters, such as The Mummy, Gladiator, and Lawrence of Arabia, just to name a few. If you’d like, we can visit either the cinema museum, or even one of the studios. Leaving Ouarzazate, will be pass through the Dades Valley, a region famous for its sprawling palm groves growing over an underground river. Along our way, we’ll visit the famous little town of Kelaat Mgouna, known across Morocco for its traditional Rose Festival in May. By the end of this long day, we will arrive in the town of Boumalne Dades where we will spend the night in a traditional Kasbah hotel. After leaving our Kasbah in Boumalne Dades in the morning, we will have the rest of the day to explore the towns on our way to the sprawling desert sands of Merzouga. Our first stop of the day will be in the small town of Tinghir, a small picturesque town where you can get a feel for how locals in this region live. 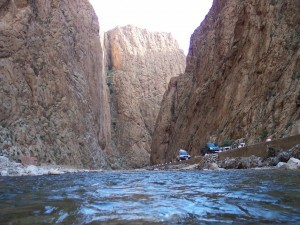 We’ll also make a short stop at the Todra Gorges where you can enjoy the marvelous canyons on foot. Continuing on our way, you’ll notice how the landscape gets more and more arid, as the temperature gets hotter and hotter, as we make our way away from the mountains and towards the desert. We’ll pass through the town of Erfoud, where we’ll stop for lunch and to visit a fossil museum, before reaching the historical town of Rissani, where we’ll get out and explore for an hour or so with a local guide. After our little tour of Rissani, we’ll drive directly towards the desert to get to Merzouga, one of the last towns before the end of the road and the beginning of the desert. In Merzouga, a camel caravan will be waiting to take us over the sand dunes to our Berber camp deep in the Sahara Desert. Here your Berber hosts will cook traditional desert meals for you, while teaching you about their culture. Spend the evening huddled around the campfire, venture out into the desert, or lie on a sand dune and gaze at the stars. 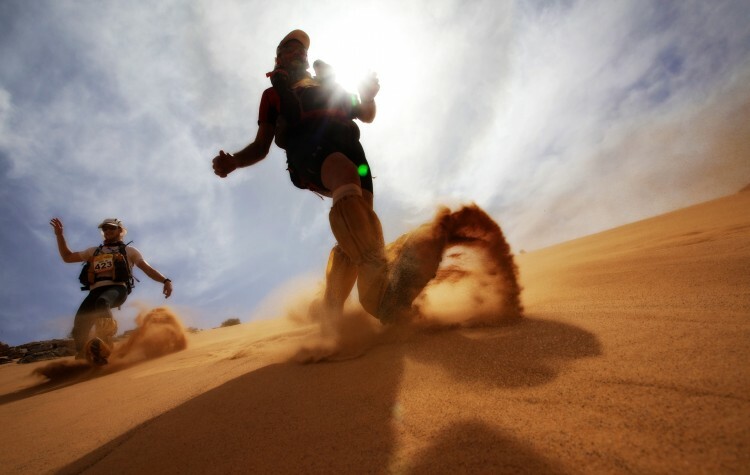 On this day you will have the opportunity to wake up early and catch the beautiful desert sunrise from atop of sand dune. 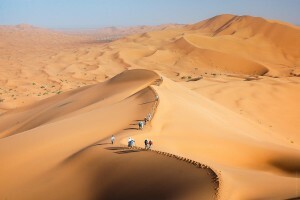 After breakfast, we will hike out of the desert on camelback to reach our van in Merzouga. After giving you the opportunity to shower and freshen up, we will take another road to get to the other end of the Moroccan Sahara desert, Zagora. Turning off in Rissani, we will pass through the small traditional villages of Alnif, N’Kob, and Agdz, before arriving in Zagora. 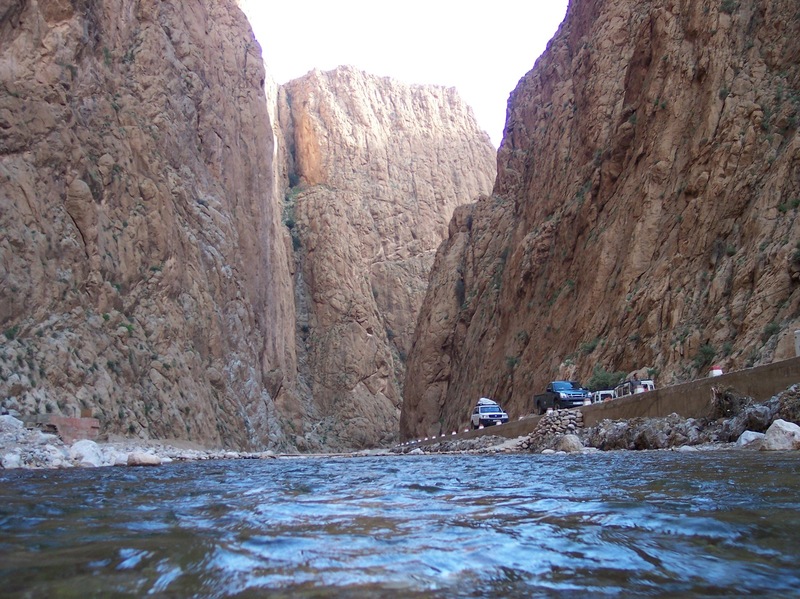 Highlights will include visiting the trilobite fossil center in Alnif and the Tamnaugalt Kasbah in the lush palm grove valleys of the Draa valley. 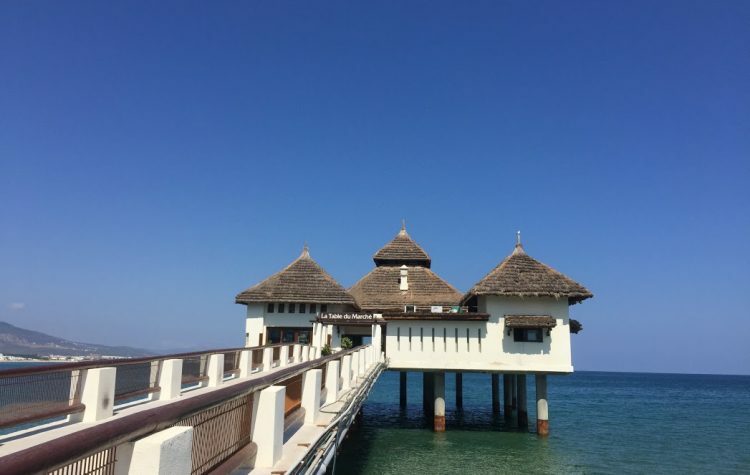 Following the road along the beautiful and lush palm valleys, we will arrive in Zagora by the end of the afternoon, where we will spend the night in a Kasbah hotel. On our last day we will drive you back to your accommodations in Marrakesh following the same road back, visiting whatever extra sites we didn’t have time to visit on our way.